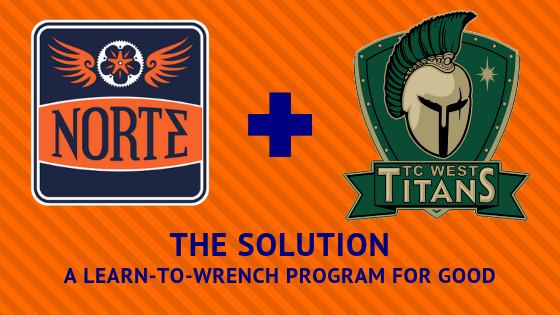 The Solution in School is part of Norte’s broader community-wide bike mechanics education initiative dedicated to empowering people of all ages and abilities to learn the skills that help promote self-assurance, confidence, creativity and lifelong bike independence. We believe that understanding basic bicycle maintenance and repair is a lifelong skill that gives the young and young at heart the knowledge and confidence to ride more, venture further and embrace a happy, healthy lifestyle. This pilot program teaches 6-7th graders basic bike repair skills in an engaging, hands-on manner. It will also do good in the community as students will be working on Traverse City’s Bike Library bicycles, which will be loaned out to local kids in need. The Solution in School begins this Friday. If you’re interested in helping, contact Ben at ben@elgruponorte.org or call the Clubhouse at 231-883-2404.